Misattribution models of auditory vocal hallucinations hold that the ­cognitive operations involved in generating internal thoughts are biased in some fashion, such that these self-generated thoughts are experienced as non-self-generated voices. Source monitoring refers to a set of normal cognitive operations that are invoked to determine the context and conditions under which a memory episode was encoded. Source monitoring paradigms are relevant to misattribution models of hallucinations when two of the monitored sources are inner (self) and outer (e.g. other) because they are assumed to share overlapping cognitive operations that lead to misattributing self-generated cognitive events to an external source (i.e. externalizations). 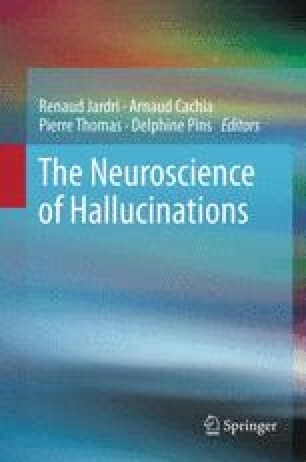 In this chapter we review how certain types of inner/outer source monitoring errors can inform misattribution models of hallucinations, and bring forward methodological issues related to task design, data analysis, and group comparisons. We review the theoretical accounts of the cognitive operations shared between hallucinations and source monitoring, and the functional neuroimaging data that bears on those models. We conclude that sufficient evidence for an ­association between hallucinations and externalization errors in source monitoring has been ­demonstrated, and that the neuroimaging results support hyperactivation of voice selective cortical regions (e.g. the superior temporal gyrus, STG) as ­underlying the cognitive operations shared between externalization errors in source monitoring and hallucinations. We provide suggestions for more comprehensive testing of misattribution models using more refined cognitive paradigms. TSW is supported by a Scholar award from the Michael Smith Foundation for Health Research (MSFHR) and a New Investigator award from the Canadian Institutes of Health Research (CIHR). The authors thank Paul Metzak and Frank Larøi for their contributions to this work.